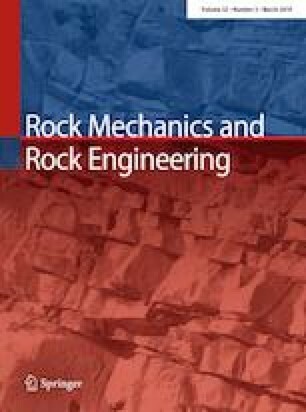 Accurate estimates of the three-dimensional (3-D) rock fracture orientation distribution are crucial for generating a reliable fracture system model. Although an earlier method by Fouché and Diebolt allows one to estimate such distributions from one-dimensional (1-D) samples, this method does not typically produce highly accurate estimates of the 3-D orientation distribution (HAE3DOD). In this study, the minimum scanline-to-fracture angle (minimum θ) and the minimum orientation sample size (minimum n) required to produce HAE3DOD are investigated. Firstly, the factors significantly influencing minimum θ and minimum n are identified, and the influence clarified. For minimum θ, the possible influencing factors include the orientation concentration parameter (к) and n, while for minimum n, the possible influencing factors include к and θ. Fractures from three selected sites in China provide sufficient data for this investigation. The investigation results reveal that minimum θ varies almost linearly with к and n. Moreover, minimum n varies linearly with к and θ. Variations in the minimum θ and minimum n values are strongly associated with discrepancies in sample density resulting from different values of these factors. To ease the estimation of minimum θ and minimum n, empirical relations that take into account the separate factors are proposed for these two variables. A practical example demonstrates that the proposed relations accurately and efficiently estimate minimum θ and minimum n and can provide sampling guidelines (i.e., the intervals of scanline direction and sample size) for producing HAE3DOD. The potential limitations of the proposed relations are also discussed. C. H. Juang: Formerly in Department of Civil Engineering, Clemson University, Clemson, SC 29634, USA. This research was funded by Zhejiang Collaborative Innovation Center for Prevention and Control of Mountain Geological Hazards under Grant no. PCMGH-2017-Z03 and the National Key Research and Development Program of China under Grant no. 2017YFC1501305. We are grateful to Dr. Dingjian Wang for assisting in the field sampling of fractures. 0.8 < c < 1 suggests a strongly positive correlation.